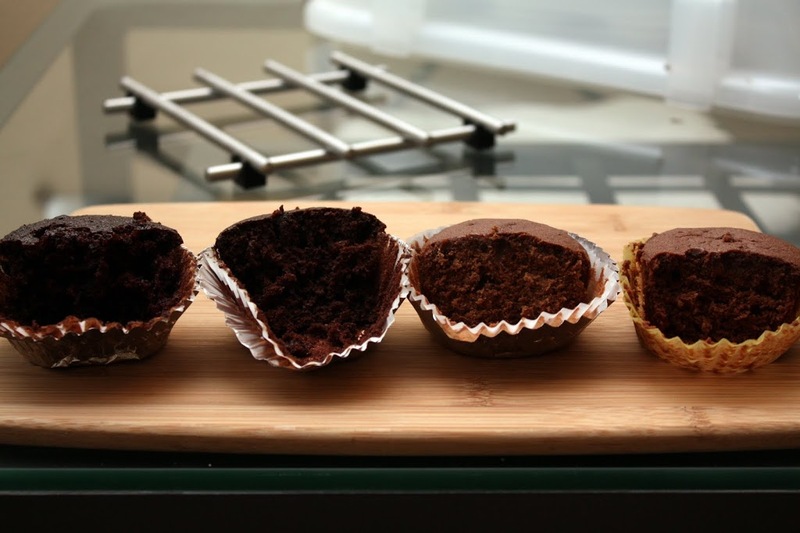 Last weekend, I decided to put four chocolate cupcake recipes to the test, in the hopes of finding an alternative to my fave Ultimate Chocolate Cupcakes recipe (which uses bread flour instead of the more typical all-purpose flour or cake flour). I hadn’t made a butter cake in so long, I forgot how different the texture and coloring is! 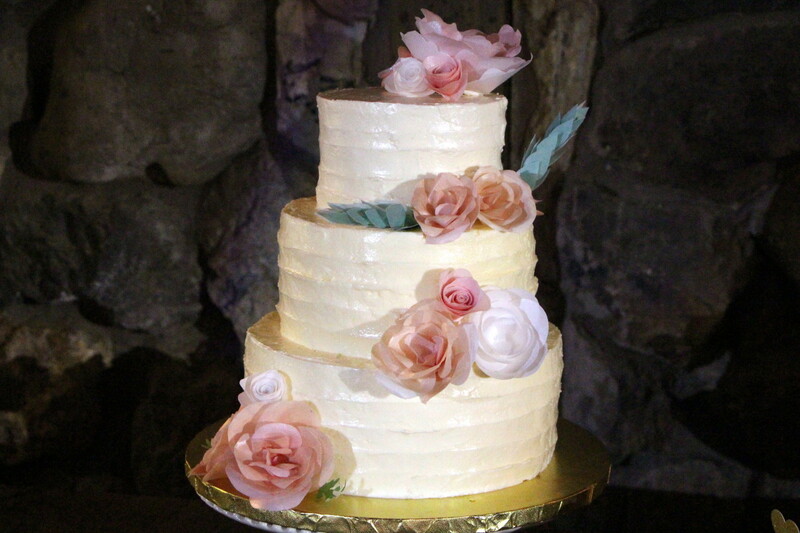 Butter cakes have a softer and finer crumb, are lighter in color compared to oil cakes, and are denser than oil cakes. 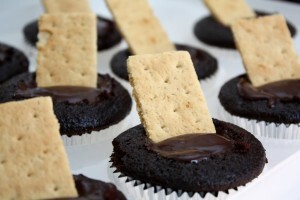 They also support a truer chocolate flavor, as opposed to the oftentimes more bitter and/or barely-chocolatey flavor of chocolate buttermilk or oil cakes. The Cupcake Wars cupcake came out a little bitter and bland. It is not a keeper for me, but being less flavorful, it served as a good template for featuring toppings and other flavorings. The Top Chef: Just Desserts cupcake was pretty good, and had a solid chocolate flavor due to a heavy dose of cocoa. I was surprised that the recipe did not use salt — I think the addition of salt would add a little more depth to the flavor. With a bit of tweaking, this could be a good recipe to keep, but flavor- and texture-wise, it did not top my favorite Ultimate Chocolate Cupcakes from Cooks Illustrated. / 4. Rose’s two chocolate butter cake recipes were melt-in-your-mouth delicious coming out of the oven. They tasted fudgy, and reminded me of a cross between flourless chocolate cakes and chocolate souffles, if that makes any sense. Delicious! When fresh, the All-American was more chocolatey and memorable than the Domingo. However, the day after, the All-American was a bit too dry and dense in texture for me (perhaps an execution error on my part). The Domingo (which uses sour cream) fared better and maintained a better chocolate flavor, even though a bit dense as well. Perhaps oil cakes are just a preferable texture for cupcakes. 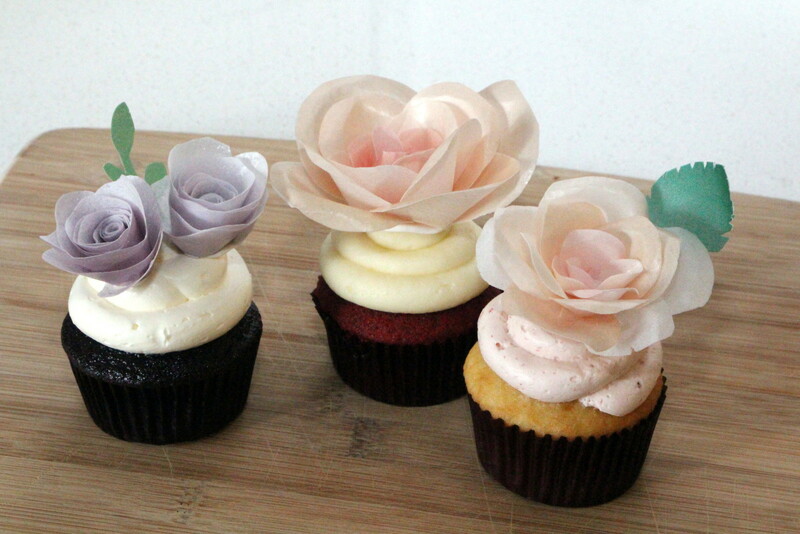 However, I can see how butter cupcakes would be much better for constructing layer cakes. 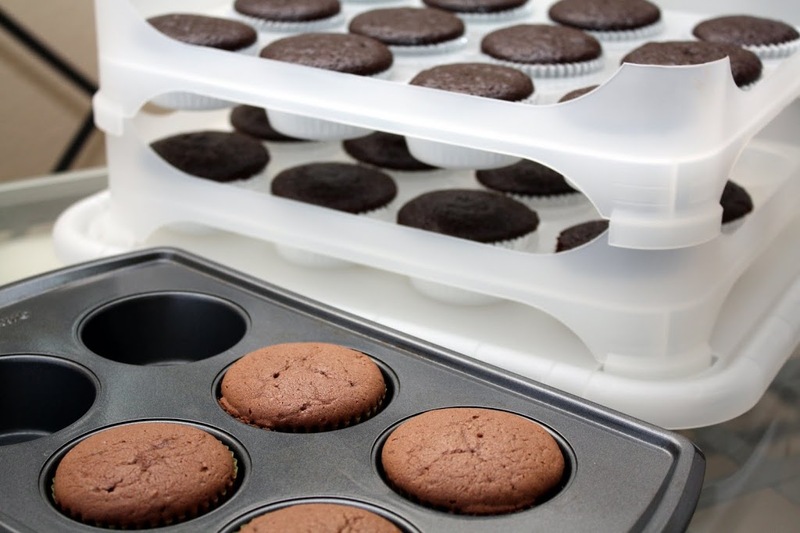 Next weekend, I think I will try the butter recipe again to see if I can achieve a better texture, perhaps using Rose’s chocolate butter cupcake recipe which adds some baking soda. Inevitably, my oven from the 70s/80s will have temperature control issues, but I will keep a closer eye. I will also try Rose’s German Chocolate Cake recipe (without the German filling/frosting), as that chocolate cake recipe is an oil recipe. So, in other words, my chocolate cake recipe experiment is to-be-continued. I topped the All-American with mocha meringue frosting, which was tasty, but ended up being my least favorite combination. I topped the Domingo with a curry chocolate ganache (rich, creamy, and with a pleasantly surprising spice kick) which went perfectly with the fudginess of the Domingo cake and created my favorite combination. I converted the Cupcake Wars cupcakes into S’mores cupcakes (filled with ganache glaze and topped with a Graham cracker and toasted marshmallow meringue frosting). Sift together the flour, sugar, cocoa, baking soda, baking powder, and salt. In a separate large bowl, combine the buttermilk, oil, eggs, and vanilla. Add the wet ingredients to the dry. Slowly stir in the coffee and water. Bake for 20-25 minutes. For the Top Chef cupcakes, I filled and topped with chocolate mint chip mousse. My execution wasn’t perfect, and my mousse was a bit too soft, but chilling the cupcake helped hold it all together. 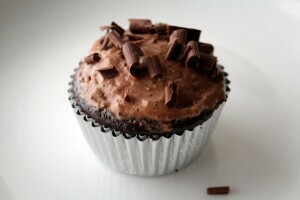 Chocolate Cupcake: Sift flour, sugar, cocoa, baking powder, baking soda into mixing bowl. Combine egg, oil, buttermilk, coffee and vanilla. Add to dry ingredients, whisk on medium, scrape down sides and whisk 1 minute more. Scoop into cupcake tin filled w/ liners. Bake at 350 degrees until done, 20-25 minutes. Mousse: Melt chocolate, whisk yolks to thick ribbon in mixer. Heat sugar and water to boiling. On low speed, slowly pour hot sugar mixture into yolks. Whip until cooled and thick. In a separate bowl whip heavy cream, crème fraiche, and mint oil to soft peaks. Fold chocolate into yolks, fold in whipped cream in 3 additions. Fold in flaked chocolate. Chill. 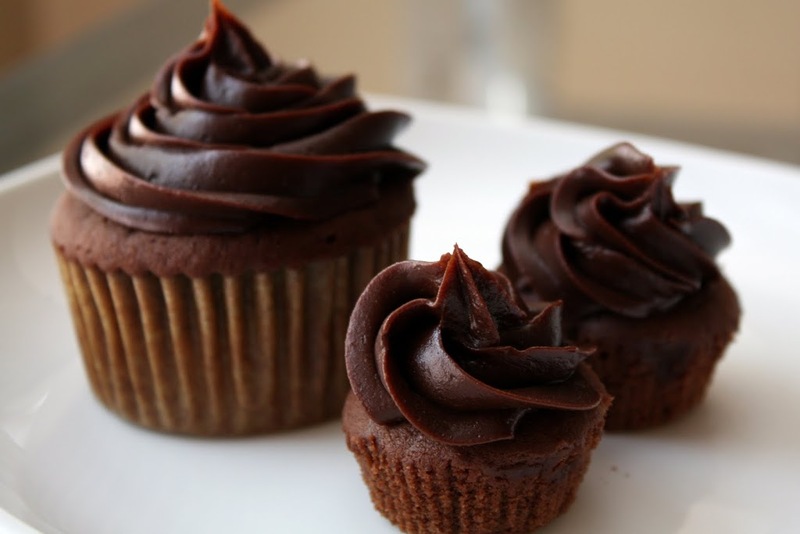 Core chocolate cupcakes and fill with mousse. 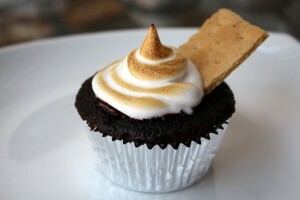 Top with more mousse (or whipped cream or toasted meringue) and sprinkle on chocolate curls. 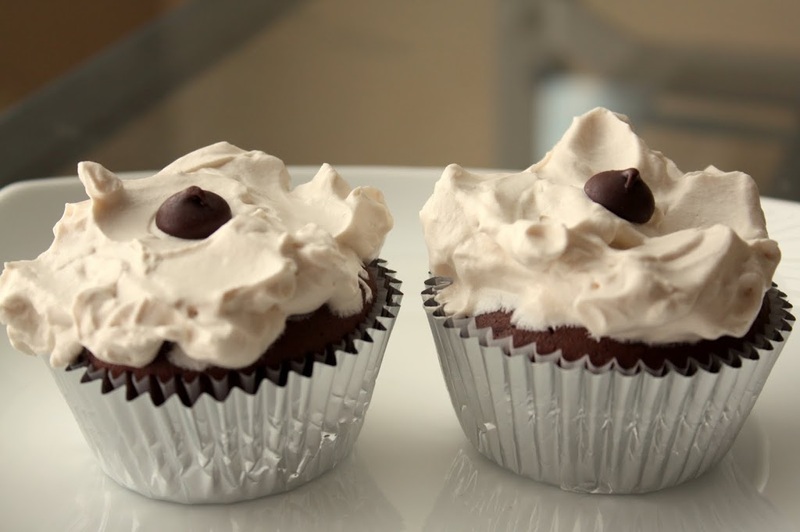 « Malted Chocolate Cupcakes – Baked Sundaes! Impressive as always, my dear. You’re going to be an awesome pastry chef!